Bulgogi is a popular Korean dish, which many people translate as “Korean barbeque.” But it is more than that. There are a lot of vegetables, too. This is two recipes, one for bulgogi, a barbecued or grilled beef, and the second one is for bulgogi stew (“jungol”). If you just want a barbecue, stop after making bulgogi from these recipes. If you want to make the stew, first make bulgogi, don’t cook it, and then continue on to the second recipe. tofu, onion, and green chili pepper. Make marinade sauce for 2 pounds of beef by mixing following: ½ cup soy sauce, 1 ts ground black pepper, ¼ cup sugar, 12 cloves minced garlic, 1 medium size onion (crushed), 1 small size of pureed Asian pear, ½ cup of water (can be replaced with cooking wine), and 1 tbs of honey. *tip: Using a food processor is very convenient. Prepare a large stainless bowl and pour the marinade sauce in it. Slice the beef thinly, against the grain, to make it tender. *tip: Keep the beef in the freezer for a few hours beforehand, then it will be easier to cut. Place the sliced beef into the marinade and add 1 or 2 tbs of sesame oil and some toasted sesame seeds. Mix it by hand and keep it in the refrigerator for at least 3 hours. After 3 hours, you can grill the meat on charcoal bbq, broil it in oven, or grill it on pan. marinated bulgogi (the recipe from above), mushrooms, green onions, tofu or noodles, and green chili pepper. Prepare a big shallow skillet. 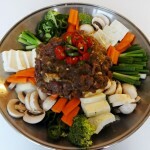 Place colorful vegetables (mushrooms, carrot, and green onions cut into bite-size pieces) round the outside with tofu, and place the bulgogi in the center. Cut up a green chili pepper and place it on top of the bulgogi on the skillet. Mix 1 can of beef broth and 1-2 cans of water and add on the skillet. Cook another 5-10 minutes over high heat and serve it. *tip: To eat it, use a serving spoon or dipper to fill individual bowls of the stew. Posted on Thursday, July 12th, 2007 at 4:15 pm. Last updated on August 7, 2017. Posted March 14th, 2016 at 9:18 pm | Log in to reply. hi i’m using this recipe for a school project and i was wondering how many people this would serve. if you can get back to me soon i would really appreciate it. thank you. Posted May 10th, 2015 at 8:41 pm | Log in to reply. I am in the middle of making this right now for the very first time! I just put the meat in the fridge. I didn’t have quite enough beef, so I added some more tofu in. I’ve made several of your recipes and my husband is so excited to try each one. So far, his favorite is Japchae. He asks me every second day when I’m going to make it again. We are both looking forward to the Bulgogi stew. Posted May 13th, 2015 at 10:54 am | Log in to reply. 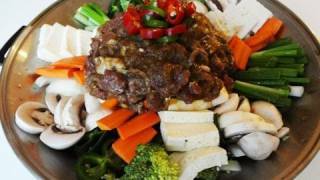 How did your bulgogi stew turn out? Good luck with your Korean cooking! Posted July 13th, 2013 at 11:43 am | Log in to reply. Posted January 15th, 2013 at 11:09 pm | Log in to reply. Posted October 12th, 2012 at 2:37 pm | Log in to reply. Great! I lived in Japan for 1 year and while I was there i sampled alot of different dishes. Two dishes became my absolute favourites, Japanese Ramen and Korean Bulgogi. Posted October 14th, 2012 at 10:06 am | Log in to reply. Ten out of ten! What a great compliment from your girlfriend! Posted July 25th, 2012 at 1:29 am | Log in to reply. Dear Maangchi, have not visited your site for a long time. But in the past, have tried some recipes. Last weekend, i suddenly got this urge to cook Bulgogi again and am so happy that your Youtube video is still here. Kids love the Bulgogi. Also did the Job Chae. I’m beginning to remember everthing again. Posted July 4th, 2012 at 8:19 pm | Log in to reply. I made this the other and it was so good, thanks! I have question, have you tried bulgogi bake from costco here in Korea because I love them so much and I was wondering if you know how to make them ‘coz be awesome! Posted March 31st, 2012 at 7:49 pm | Log in to reply. hmmm just wonderin if you could share some recipe for little children also? Posted January 6th, 2012 at 1:09 pm | Log in to reply. Posted July 23rd, 2011 at 10:06 am | Log in to reply. I have a question. Could I put a cup of honey-powder instead of sugar? Posted July 23rd, 2011 at 10:55 am | Log in to reply. Posted June 16th, 2011 at 4:24 am | Log in to reply. Thanks again, Maangchi for all your amazing recipes! Posted June 17th, 2011 at 9:12 am | Log in to reply. awesome! 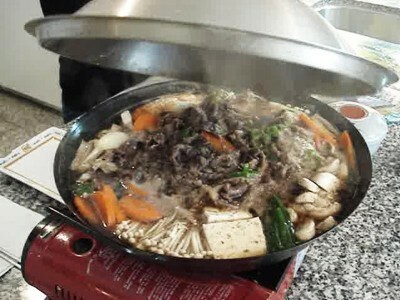 Your bulgogo photo looks so yummy especially the big chunks of white mushrooms! Posted April 9th, 2011 at 1:36 am | Log in to reply. I just made this for the family dinner tonight and was amazed by how easy this was to make. I marinated the meat yesterday night so it was ready to go for tonight. What impresses me about your recipes is that they are so very tasty, and you do NOT use MSG – my husband gets sick from MSG. Thanks for teaching us the tricks that lead to naturally tasty food!! Posted April 9th, 2011 at 8:35 am | Log in to reply. I’m glad to hear about your successful Korean cooking! Cheers! This recipe was originally posted on July 12, 2007 at 4:15 pm by Maangchi. It was last updated on August 7, 2017. The video was watched 391,450 times on YouTube & has 1,648 likes!